Qanta Ahmed, a doctor and Muslim of Pakistani descent, is a British citizen who was practicing in NY when her visa renewal was denied. 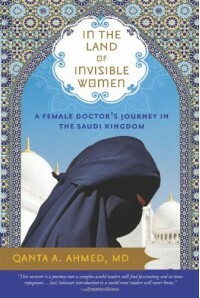 Practically on a whim, she decides to accept an offer to spend 2 years at a Saudi Arabian hospital. This book is a memoir of her time there. On the positive side, any glimpse of a culture so alien to most Western eyes is welcome (even one as unreflective and blinkered as this proves to be). Unfortunately, the author can't write and her editors were slacking off and not very helpful. There are some truly wince-inducing passages, such as "Now I had a reason to contact him. I was surprised at my cunning. At least one female trait had not deserted me here" (p. 250) or "My detection of latent homosexuality was probably accurate." (p. 270) The reader must also endure clunky and strained metaphors and criminal misuse/overuse of adjectives. Amateurish writing could be forgiven, however, if Dr. Ahmed had ever really engaged the reader (or herself) on an emotional level. I don't disbelieve that she had some profound experiences or that she made real friends in her two years in the Kingdom but she doesn't have the ability to convey that in her prose, which often reads like a newspaper article or the strivings of an undergraduate anxious to get some use out of that thesaurus she bought. I actually grew to dislike Ahmed to some extent. In her two years in country, she never attempted to learn any Saudi Arabic dialect; she was as dependent on translators to talk to her patients on her last day as she was on her first. If I were spending several years in a country, I would make some effort to pick up the local tongue; even vacationing, I'd want some familiarity with a language. As a doctor, I would think speaking your patient's native language would be essential. In every direction I looked upon thousands of vagrant pilgrims. Perhaps hundreds of thousands could be here tonight, hiding in the shadows. Yet they were patient, silent, and not the least resentful. They watched me without judgment. Their eyes, glinting in the dark, didn't contain criticism.... Accepting their hardships, they squatted on lean haunches for hours, waiting for dawn without resentment or question. My heart expanded with love. In the deep darkness of that night, finally I heard a message I specifically needed. Their desperate poverty contained an enormous grace, one which, despite my privilege or perhaps because of it, I sorely lacked. Once again, I was deeply humbled. The arrogance stuns me anew as I copy it. "Not the least resentful"? "Watched without judgment"? "Accepting their hardships"? How can she possibly know this?! She doesn't even speak the language. She makes no effort to engage these women or anyone beyond the privileged circle of doctors and their families she works with. I'm reminded of a Somerset Maugham's observation that poverty is noble and uplifting only in the eyes of a man who has wealth. To the poor, it's just a burden whose "nobility" and "uplift" they could sooner do without. There are some affecting moments in Ahmed's tale. The reactions of her Saudi acquaintances to 9/11 is revealing - of the Saudi depth of hatred for the US and Jews in the Kingdom as well as the author's near total lack of understanding of them or the society she'd been living in for two years. Ahmed also manages to convey is some passages a taste of the paranoia and neurotic misogyny that poisons Saudi society and their interpretation of Islam (if only she were a better and more introspective writer!). A flawed but interesting read.